What should I do before going to production? Keep in mind that Linkurious Enterprise can be used without Elasticsearch, see search options. By default, SQLite is used for the user-data store. SQLite is not recommended for production environment: switch to MySQL/MariaDB/MSSQL instead. How can Fault tolerance be achieved? Linkurious Enterprise can be set up with a backup instance to allow for continuity of service when the main server crashes. if alerts are in use, they should be enabled only on the main instance. See nginx documentation for more details. Where is the user-data store located? The user-data store database (containing visualizations, saved queries, user, groups, etc) is stored in a SQL database. By default, this database is an SQLite database (located at linkurious/data/database.sqlite). In production, the use of a MySQL/MariaDB/MSSQL database is recommended. These databases can be located on a remote server. Is the user-data store encrypted? The default user-data store (SQLite) is not encrypted. Is it possible to delete the SQLite user-data store when using an external database? Yes, when using an external user-data store (e.g. MariaDB, MySQL or MSSQL), the SQLite files can be deleted. What kind of information is stored in the configuration file? The configuration file contains all configurable options, as well as the configuration options of all configured data sources (e.g. MySQL host/port/username/encrypted password; Neo4j URL/username/encrypted password; Elasticsearch URL/username/encrypted password, etc). All passwords/secrets in the configuration file are encrypted before storage. The configuration file, like the rest of the data folder, should be considered private and not be readable by anyone other than the Linkurious Enterprise service account. How are application secrets stored? All application secrets stored by Linkurious Enterprise (Neo4j credentials, MySQL credentials, Elasticsearch credentials, SSL certificate passphrase, etc.) are encrypted using the AES-256-CTR algorithm. How are user credentials stored? User passwords are strongly hashed before being stored in the database. Passwords for LDAP and other external authentication solutions are not stored at all. Where is the audit trail stored? The audit trail files are generated in linkurious/data/audit-trail by default. This path can be set in the audit trail configuration. Does enabling the audit trail require additional security measures? The audit trail contains sensitive information and should be secured. It should be owned and readable only by the Linkurious Enterprise service account. How can the data directory be secured? What is a service account and why should I use one? A service account is an operating system user account with restricted privileges that is used only to run a specific service and own it data related to this service. Service accounts are not intended to be used by people, except for performing administrative operations. Access to service accounts is usually tightly controlled using privileged access management solutions. Service accounts prevent other users and services from reading or writing to sensitive files in the directories that they own, and are themselves prevented from reading and writing to other parts of the file system where they are not owners. Can Kerberos be used for single sign-on? We do not support Kerberos as of now (but we support many other SSOs). What do the log files contain? Technical logs (data/logs/linkurious.log and linkurious.exceptions.log): Server debugging logs (may contain graph queries). Audit Trail (data/audit-trail/audit-trail.log): See audit trail log format details. How can the communication with an LDAP server be secured? If your LDAP server supports secure LDAP, use the “ldaps://” protocol in your LDAP configuration. How can Elasticsearch be secured? Can I use Linkurious Enterprise without Elasticsearch? Most graph vendors support search strategies other than Elasticsearch. See dails on our search options page. Can I use a custom tile server in geospatial mode? Yes. See the geospatial configuration options for further details. 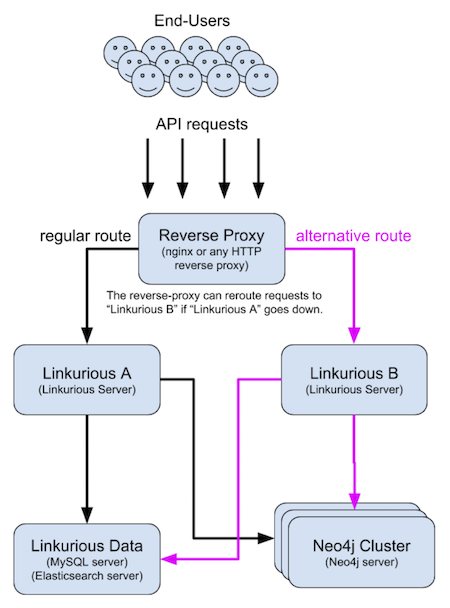 What are the command lines utilities to administrate Linkurious Enterprise? Will enabling the audit trail impact performance? Depending on the configuration options specified, enabling the audit trail can have an impact on performance. See the audit trail documentation for details.